Days of Our Lives spoilers tease that the truth of Jack Deveraux’s (Matthew Ashford) six missing years will be revealed with the revelation that Eve Donovan (Kassie DePaiva) and Xander Kiriakis (Paul Telfer) are in cahoots! Xander was presumed dead along with Nicole Walker (Arianne Zucker) in the explosion of a warehouse where Kristen DiMera (Stacy Haiduk) was also trapped in. 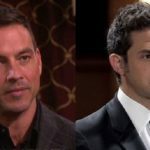 However, prior to the explosion, Brady Black (Eric Martsolf) had discovered the warehouse, with initials on locked doors that could belong to missing and presumed dead Salem residents, including one with the initials “JD”… Jack Deveraux! Eve’s sister, Theresa Donovan (Jen Lilley) had nearly been killed by Xander, so why Eve would align with him is puzzling at best! Other Days of Our Lives spoilers tease that Nicole will show up alive as well, sometime in 2019. Current Days of Our Lives spoilers from Soap Opera Digest say that Eve is in possession of a flash drive, possibly containing Jack Deveraux’s memories, and will turn it over to Xander. If this is true, this must be a plot for Eve to continue to control Jack, possibly with Xander’s help. Eve also continues to make herself an obstacle between Jack’s family and himself, Jennifer (Melissa Reeves) in particular. Eve plans to use Jack as a weapon against Jennifer, and Eve wants Jack to herself, preferably as her husband! It would seem, from the Days of Our Lives scenes of them getting ready to go to the Horton Center in their room at the Salem Inn, that there’s been some husband-wife type behavior going on between them already, since a man’s hand, presumably Jack’s, was seen zipping up the back of her dress! Jennifer’s, JJ’s, (Casey Moss) and Abigail’s (Kate Mansi) lives are sure to be affected for quite a while with Jack’s sudden reappearance, his amnesia (likely caused by some memory-removing procedure or hypnosis) and Eve and Xander continuing to pull the strings in Jack’s life! Stay tuned to Days of Our Lives and keep checking Days of Our Lives spoilers frequently, to see how this story develops and if Jenn and Jack might ultimately get back together with his memories and their love restored!